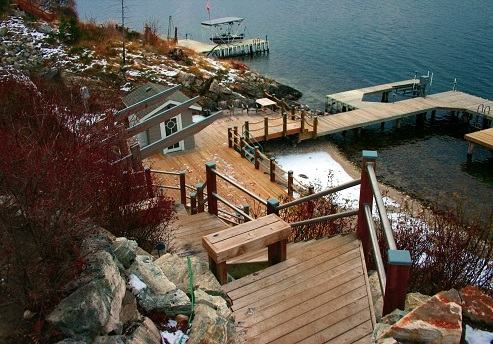 LAKEFRONT HOME - Rick and Lynn had a beautiful lakefront home that was rebuilt after the Okanagan Mountain Park Fire. The existing dock was lacking the supporting beach patio and shade area, so we added a cool seasonal glulam shade structure with an expanded patio concept. There was an existing storage building as well that we redesigned into a cool kitchen and a practical wet bar, as the home was perched high above the shoreline. We brought in a new hot tub and placed it in a perfect lake view spot, giving access from both the house and the lake.